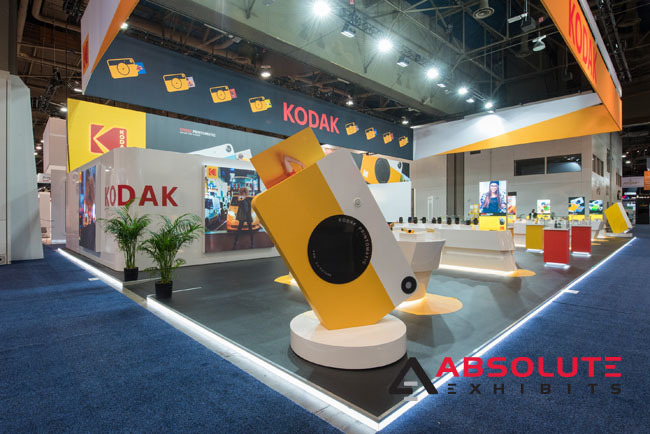 Client Spotlight: Kodak Instant Print Category at CES 2018 | Absolute Exhibits, Inc.
For over 50 years, the Consumer Electronics Show (CES) has served as a space for global brands to share consumer technology. Now officially held in Las Vegas, CES has drawn over 184,000 attendees with over 3,900 exhibitors. For decades, CES has served as both a proving ground for innovators and as a place for reinvention. It is the premier show for organizations looking to capture consumer attention with their convention exhibit. Kodak is an iconic brand, which has been reinventing itself since 2012. Since the early 1900’s Kodak has been associated with photography. However, they now see themselves as a technology company focused on imaging. At CES 2018, the Kodak Instant Print Category wanted to feature its new instant print cameras in an interactive convention exhibit with a sense of joy and wonder. Kodak Instant Print Category wanted a convention exhibit that was a modern fun expression of their commitment to imaging. 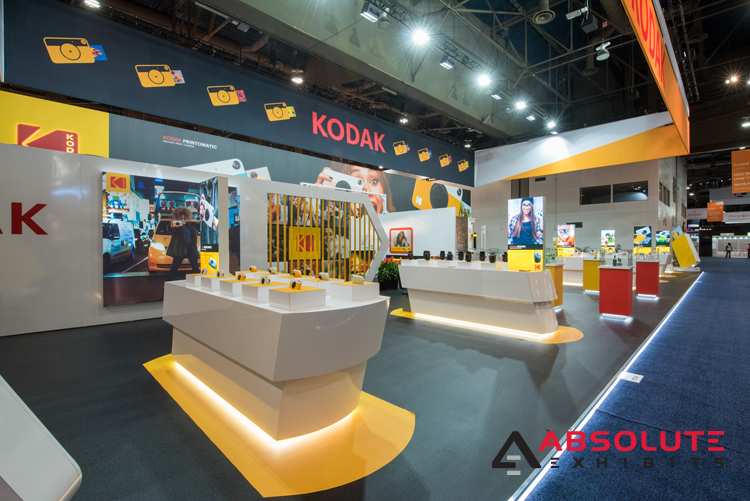 With a history of innovative product launches, Kodak Instant Print Category wanted a convention exhibit that would become a focal point of the trade show floor. Absolute Exhibits produced a modern interactive convention exhibit that recalled a sense of wonder and joy while strolling the streets of Paris. 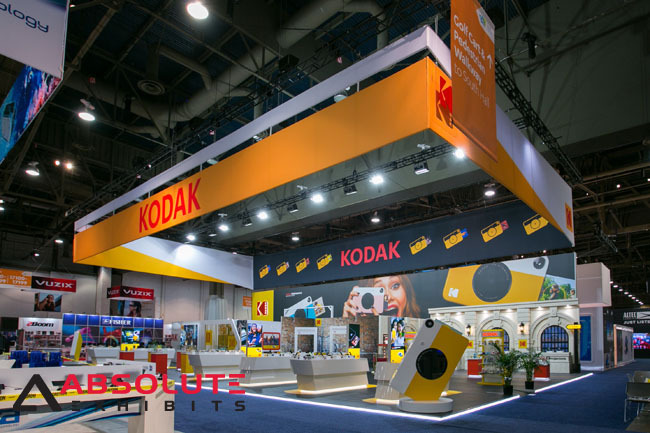 This 50’x90’ booth featured a double-sided fabric sign announcing the Kodak Instant Print Category brand. The walls were a cut and weathered foam to look like Parisian cut stone. This was set against a raised floor surrounded by LED lights, the back ¼ of which was painted to look like the streets of Paris. On these streets, mimes and jugglers delighted show attendees. On each corner of the convention exhibit sat custom 3D prop cameras mounted on a pedestal. Inside was a semi gloss photograph set to an actuator that would trigger a flash of the camera as the photograph raised and lowered. In the open booth, display cases with toe kick lighting beneath the stand showed off additional products. In addition to the street performers, attendees could take a photo against a graffiti wall using a standard PVC graphic Instagram display. Next to this experience was also an enclosed projector room featuring 3 mini projectors inside and a full bar and lounge on the other side. “This project was really a labor of love. To bring such a bold design to fruition took a lot of communication and attention to detail. Working with Michelle on this project really was a treat and the end result was a beautiful booth that consumers at CES loved,” said Account Executive Kyle Moeller. Absolute Exhibits built a custom designed convention exhibit that was truly spectacular. 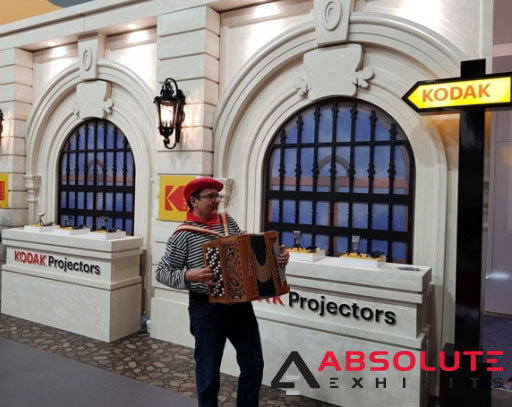 Attendees experienced an interactive convention exhibit that encouraged the sense of wonder and joy they experience using Kodak Instant Print products.